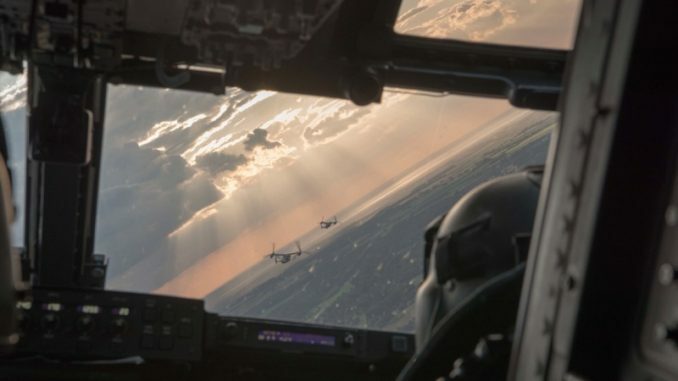 CV-22 Ospreys of the 352nd Special Operations Wing (SOW) flying over England in August 2017. (Photo by AFSOC). SOF News Update 20171204 – USSOCOM 2018 Fact Book, Metz on the demise of COIN, book review No Front Line, award for “Spooky 43” aircrew, more to do in Iraq, armed drones over Niger, SOCSouth cdr promoted, USASOC birthday, Mattis abroad, ‘SFA / TAA’ not the answer, Thompson sub-machine gun in Vietnam War, AFSOC hurricane support, and more. USSOCOM 2018 Fact Book. Each year the United States Special Operations Command provides a publication highlighting the commands and missions of USSOCOM. It is a glossy presentation that provides some facts and figures on the worldwide activities of U.S. special operations. Worth a look. Book Review – No Front Line. Chris Masters new book – No Front Line – is a comprehensive history of Australia’s Special Forces involvement in the Afghan War for over 12 years. (The Australian, Dec 2, 2017). Armed Drones over Niger. The African country of Niger exploded onto the headlines when four U.S. Soldiers of the 3rd Special Forces Group were killed in an ambush by a terrorist group operating from across the border in Mali. One aspect of the mission that received criticism was the apparent lack of timely air support for the small patrol operating in a dangerous region. It appears that the Niger government has given approval for the U.S. to operate armed drones in their airspace. This will be a significant improvement for the force protection of U.S. special operations (and other units as well) that are operating in Niger. Read “Armed US Drones to Start Flying Over Niger”, Voice of America, November 30, 2017. More to Do in Iraq. Emma Sky, a Brit Middle East expert, has wrote up reasons why the United States should not leave Iraq. ISIS still exists, although in a different form, but it still retains the capacity to conduct attacks internationally. The state of Iraq still needs to be strengthened and the U.S. would leave a vacuum if it left now. Sky provides us with a little bit of history on how we got from 2003 to 2014. She then maps out the political landscape of where we are now after the three year battle against ISIS (2014 – 2017). Most important, she offers ways for the United States to continue to be engaged in Iraq. Read “Mission Still Not Accomplished in Iraq”, Foreign Affairs, December 2017. USASOC Birthday. On December 1, 1989 the United States Army Special Operations Command was activated. The was activated just prior to Operation JUST CAUSE (Panama) and Operation DESERT SHIELD and Operation DESERT STORM. AFSOC Hurricane Support. The 27th Special Operations Wing responded very quickly to the ravages of Hurricane Irma in the Caribbean. Medics from the 27th SOW were some of the first medical professionals on the ground in the initial days. (USAF Schriever Air Force Base, Nov 29, 2017. History of Thompson SMG in Vietnam. A short history of the Thompson submachine gun used during the Vietnam War. Read “The Tommy Gun ‘In Country’: The Thompson SMG in Vietnam”, American Rifleman, December 1,2 017. SOCSouth Commander Promoted. A Navy SEAL has been promoted to the rank of rear admiral (upper half). Collin Green has been the commander of Special Operations Command South since 2016. (DVIDS, December 1, 2017). Award for “Spooky 43” Aircrew. In November 2016 an AC-130U Gunship provided close-air-support to a U.S. Special Forces team and 43 Afghan soldiers near Kunduz, Afghanistan. During the course of two hours of intense combat the AC-130U repeatedly fired its weapons against ground targets threatening the Green Berets. Read “Heroic Spooky 43 aircrew receives the Mackay Trophy”, U.S Air Force, December 1, 2017. Opinion – Review of SFQC Needed. A local North Carolina paper stepped out and commented on the controversy surrounding the Special Forces Qualification Course at Fort Bragg, North Carolina. Read “Our View: Special-ops review is wise”, The Fayetteville Observer, December 2, 2017. Mattis Traveling Abroad. Secretary of Defense is (was) overseas hitting a number of countries during a five day trip. First up was Egypt (with 1/3 of the Arab population and a terrorist problem in the Sinai. The next stop was in Jordan to attend the Aqaba Process (current concern is West Africa). Then its on to Pakistan (love to hear those discussions) and finally Kuwait. Much of his trip is to coordinate and support the ‘network’ of countries in the fight against ISIS and other insurgent / terrorist groups. Metz on the Demise of COIN. Steve Metz, of the Army War College, writes about the failures of counterinsurgency doctrine as a way of stopping terrorism. He advocates limited COIN operations to fight terrorism – utilizing a “clear” methodology – and skipping the “hold” and “build” aspects of COIN. Read “Abandoning Counterinsurgency: Reviving Antiterrorism Strategy”, Parameters, Autumn 2017.